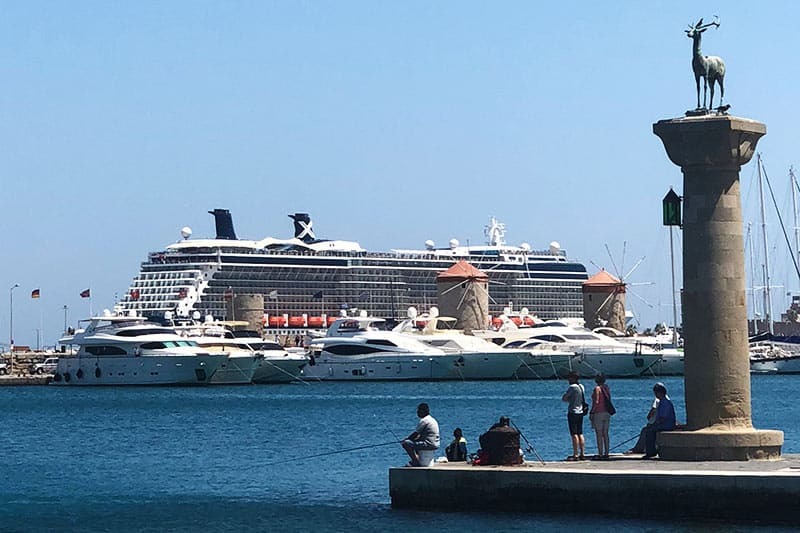 This Italy and Greek Isles Cruise post is sponsored by Celebrity Cruise Lines. Last month I had the opportunity to take a luxurious 10 night Italy and Greek Isles Cruise on Celebrity Cruise Lines. My husband and I were celebrating our 40th wedding anniversary and the cruise was the perfect way to celebrate. Here’s a little taste of the islands. Going to Greece has been on my bucket list for a long time, but I couldn’t decide on which island to visit. So a cruise that stopped at several of the Greek islands sounds like the perfect solution. 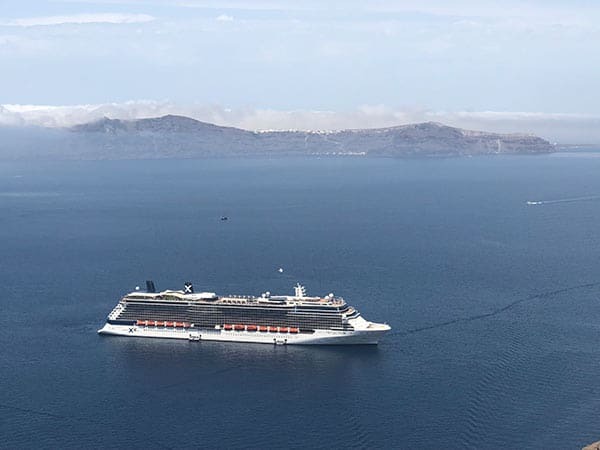 The ship departed from Rome (Civitavecchia) Italy, and stopped in Sicily Italy, Valletta Malta, Mykonos Greece, Rhodes Greece, Santorini Greece, Athens Greece, and Naples Italy. Our ship was the beautiful Celebrity Reflection. We had a Deluxe Ocean View Stateroom with a Veranda. It’s hard for me to get completely away from work (I’m finishing up the last details of my new cookbook Instantly Sweet), so I brought along my laptop. 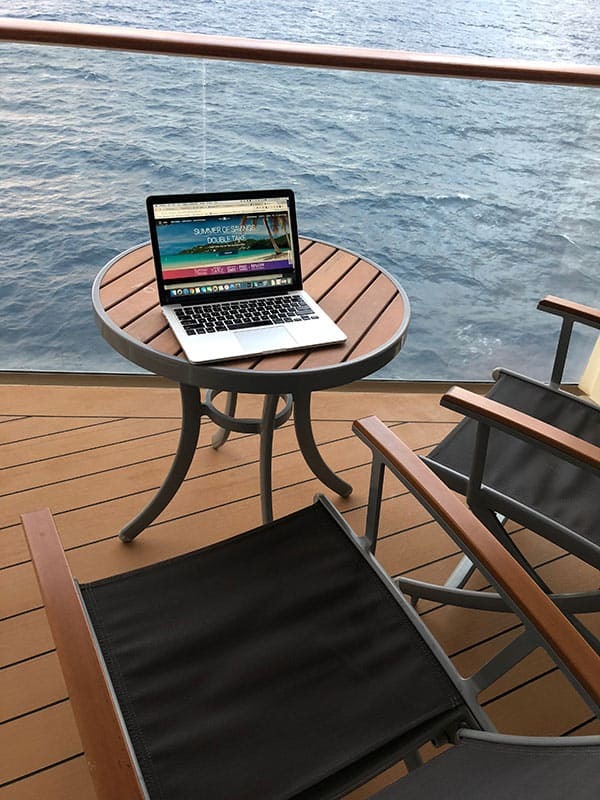 I loved working out on my beautiful balcony after a busy day touring the islands, and during the two relaxing days at sea. Our first stop was Messina in Sicily. Instead of booking a tour, we took a taxi to the town of Taormina. 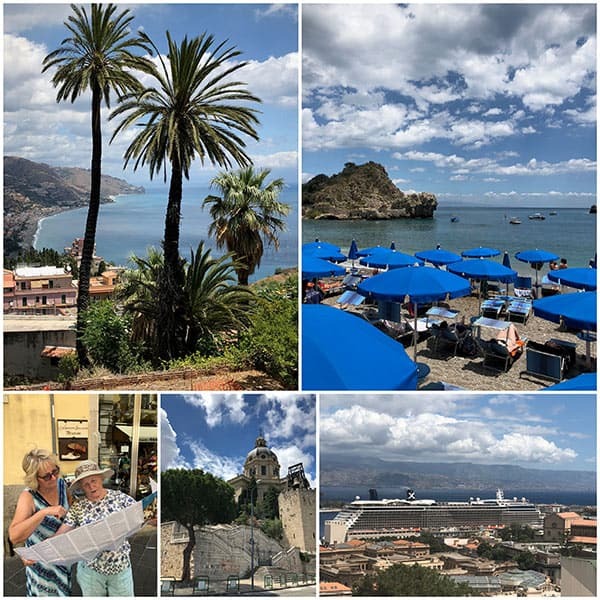 Taormina is a quaint hilltop town with a funicular you can ride down to the beach and take a dip in the Mediterranean sea. We shared the taxi with a cute couple we met from the UK. One of the nice things about cruising is meeting wonderful people from around the world. Our second port was Valletta, Malta. 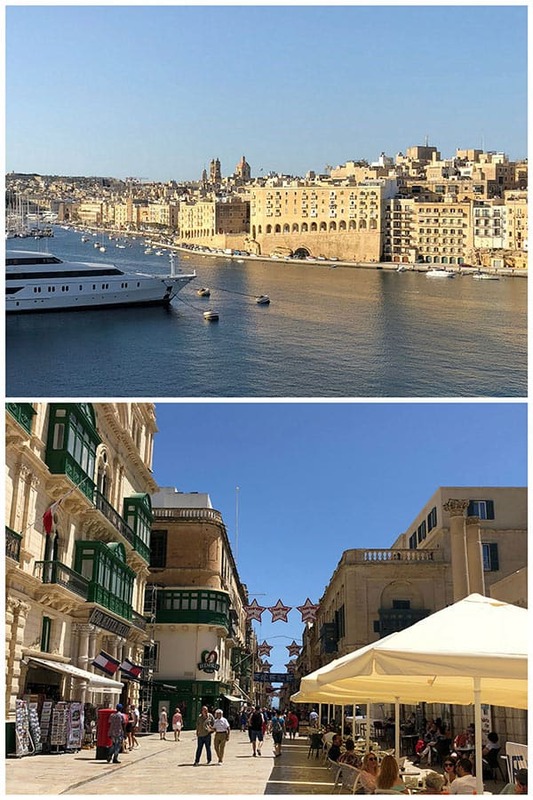 I wasn’t familiar with Valletta before our cruise, but I was so impressed with this beautiful city. A UNESCO World Heritage Site sailing into port you could imagine the island as it was when it was built in the 16th century. We bought a hop on hop off bus pass before leaving the ship and visited the town of Mdina, an ancient walled city with cobbled streets and medieval architecture. Then we hopped off in Valletta for lunch, shopping and a stroll around the picturesque town. 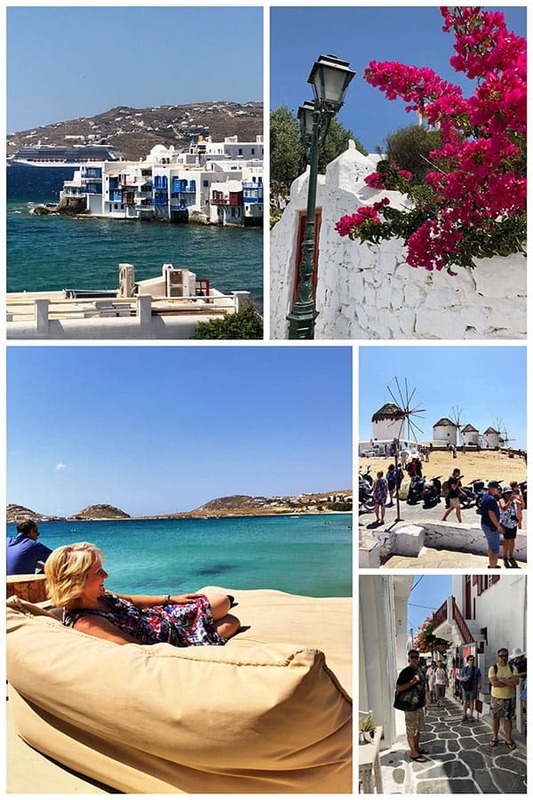 Mykonos, Greece was our third stop and one of the places I was most excited to visit. We took a private tour of the island with a group of fellow passengers from the ship. We stopped at Agios Giannis, a small fishing port, and then Kalafatis beach. I was lounging on a beach loveseat in the picture above, just look at the color of that water! Then we visited Ano Mera, the second main village of Mykonos, Ornos Beach, and we ended our day in Mykonos town. 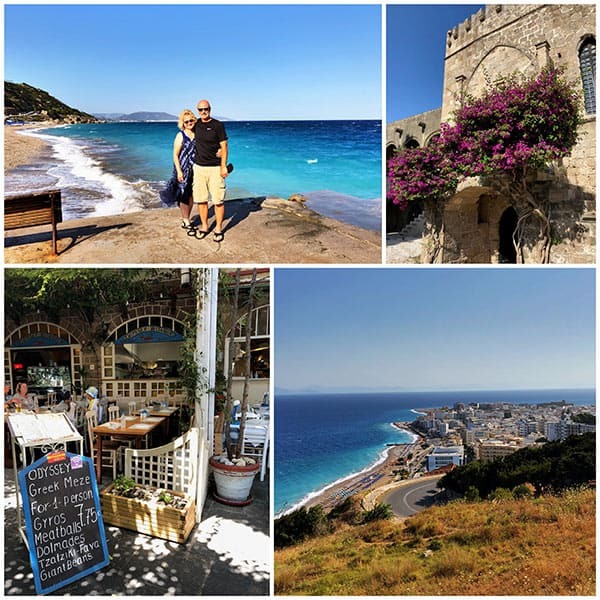 Rhodes, Greece was one of the islands that wasn’t on my radar before we visited and I fell in love with it. Rhodes has an Old Town with narrow, medieval streets filled with shops and restaurants. We’re beach people and Rhodes has lots of beaches to choose from. We visited Elli beach because it was close to Old Town and we could walk there from the port. There are lots of umbrellas and sunbeds on the beach so it’s a fun spot to relax and spend the day. Santorini, Greece was our fifth stop. It is a volcanic island and the buildings are built into the rock. 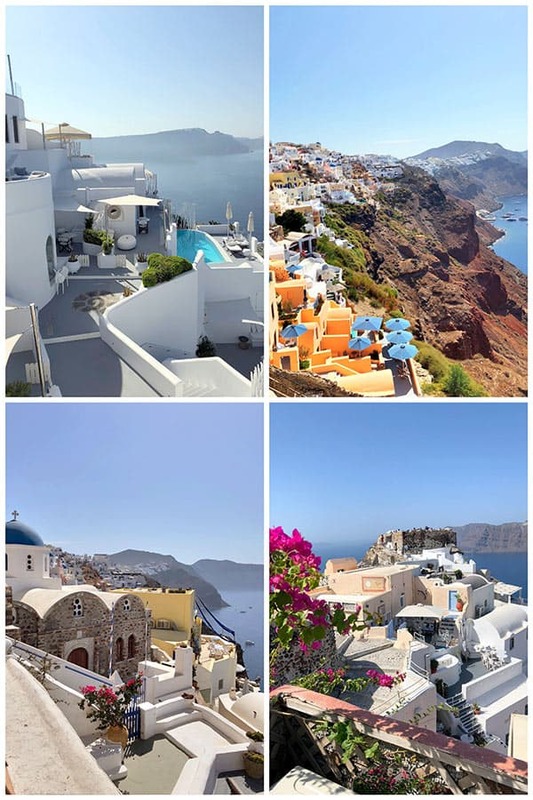 When I think of Greece, I think of Santorini with it’s stunning white buildings and blue roofed churches. I booked the ships tour so that we could catch one of the first tenders to the island and visit the village of Oia before it got too crowded. I longed to lounge at one of the Oia hotels with a pool over looking the sea with a good book. Athens, Greece was our second to last stop. I was blown away by the views from the Acropolis. It is set upon a hill with 360 degree panoramic views all the way to the sea. It’s amazing to be able to walk where people walked in the fifth century BC. There’s a beautiful new museum where you can learn all about the history of the Acropolis and the Parthenon. Our final port was Naples, Italy. In Naples there are so many great choices for excursions. 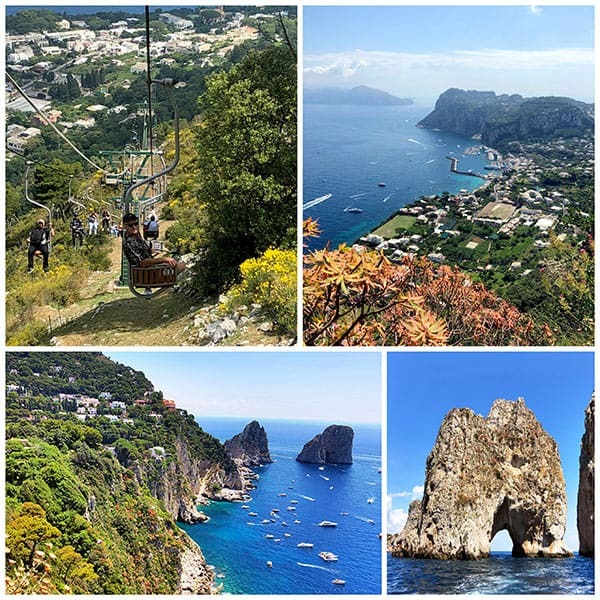 Positano, Sorrento, Pompeii, and Capri. We opted to head to the island of Capri and we fell in love with it. It’s more tropical than some of the other islands we visited – it was so green and beautiful. We started with a visit to the town of Anacapri at the top of the island. To get there you take a bus on a crazy narrow road our tour guide called the “Mamma Mía …. Oh my God Road!” Then you take a chairlift that goes to the highest point of the island Monte Solaro which is 2000 feet above sea and has amazing views. We spent some time shopping and had lunch on the island. Then took a boat tour around the entire island visiting the White Grotto, the Red Grotto, the Green Grotto, the natural arches and the amazing rocks formations. We had two days at sea where we could just relax and enjoy the ship. I sign up to do Zumba one day while my husband played Bingo. We enjoyed the great shows every night in the theater. We spent time watching karaoke, salsa dancing, and I spent some time at the spa getting a massage. There was so many fun options, or you could just spend the day relaxing pool side if you preferred. In addition to enjoying the great meals in the main dining room. We ate at many of the specialty restaurants on the ship. 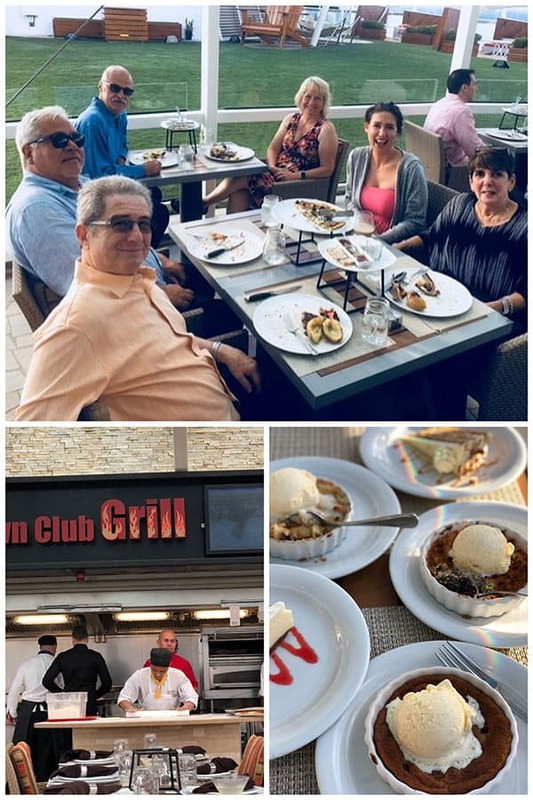 Our first night aboard, we ate at the Lawn Club Grill. The Lawn Club Grill is an open-air restaurant with a view of the sea as you’re sailing away. You can watch the chefs prepare your flatbread or even help cook your own steak on the outdoor grills. We were seated next to two couples that met during embarkation and decided to dine together that evening. Both the gentlemen were named Mark – one Mark was from California and one was from New Jersey. When they learned that my husband’s name was also Mark, they decided we all needed to take a picture together to remember the moment. People are always so friendly on a cruise and we enjoyed visiting with people sitting near us at meals, before the shows, or whatever fun things you’re up to on the ship. 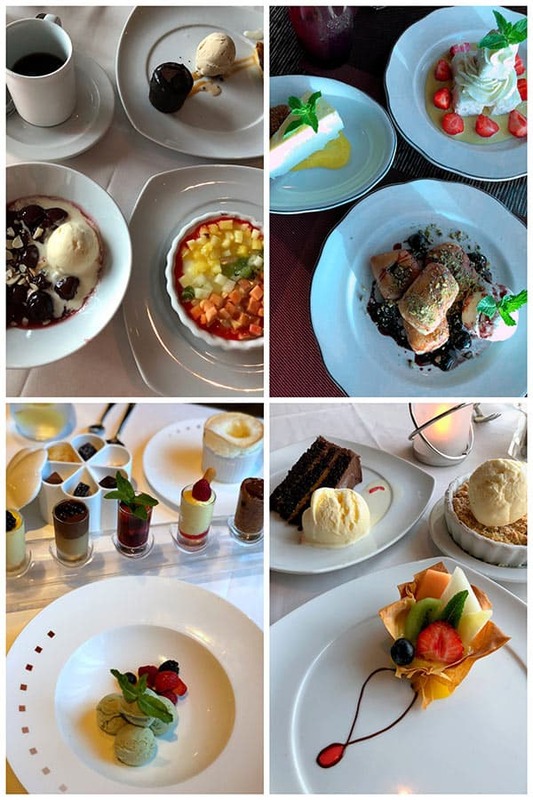 We also dined at the Tuscan Grille, an upscale Italian restaurant one night for dinner and again on a sea day for brunch – I highly recommend both the dinner and the brunch. At The Le Petit Chef At Qsine a funny video plays on each plate on your table before each course. We spent our anniversary at the Murano, which is the most luxurious restaurant and serves classic French dishes. 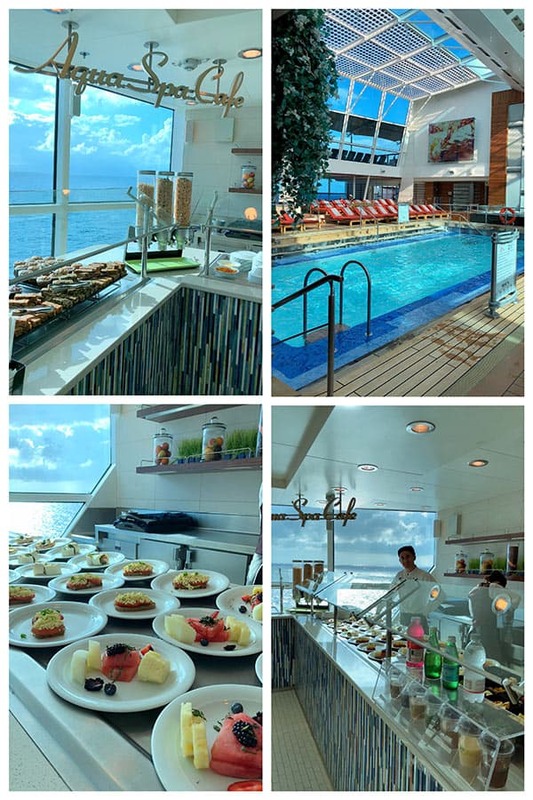 One of the ways to eat healthy on the ship was the Aqua Spa Cafe. The Aqua Spa Cafe was located in the corner of the Solarium, an adults only pool area. They served better for you fare for breakfast and lunch. Most mornings I opted for fresh fruit and half a bagel topped with peanut butter and banana, or avocado toast with eggs. I was impressed with the wonderful meals in the main dining room. 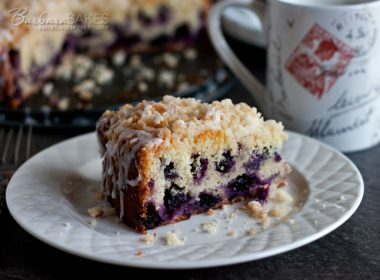 Especially the desserts. 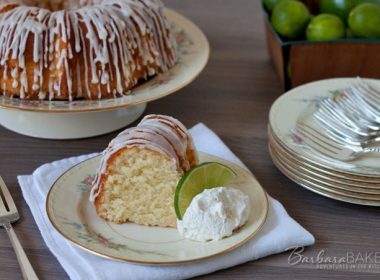 My husband and I love a great dessert, so we splurged on desserts at dinner. For the most part, we skipped the cookies, ice cream and sweet breakfast treats and ordered several desserts to try with dinner. The desserts were beautifully plated and they had a wide variety, with something for every taste. Some of my favorites were the cherries jubilee, the Grand Marnier souffle at the Murano, and the chocolate cake with a dulce de leche filling. The chocolate cake with a dulce de leche filling was available every night in the main dining room and I ordered it 3 nights. 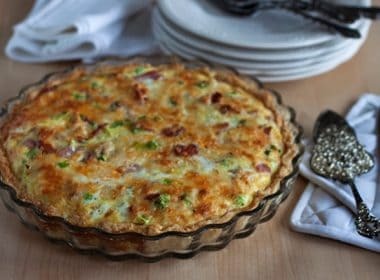 I plan to recreate it at home. 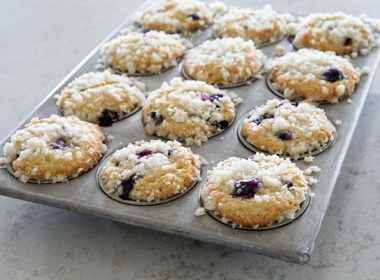 So look for my version of their recipe soon. 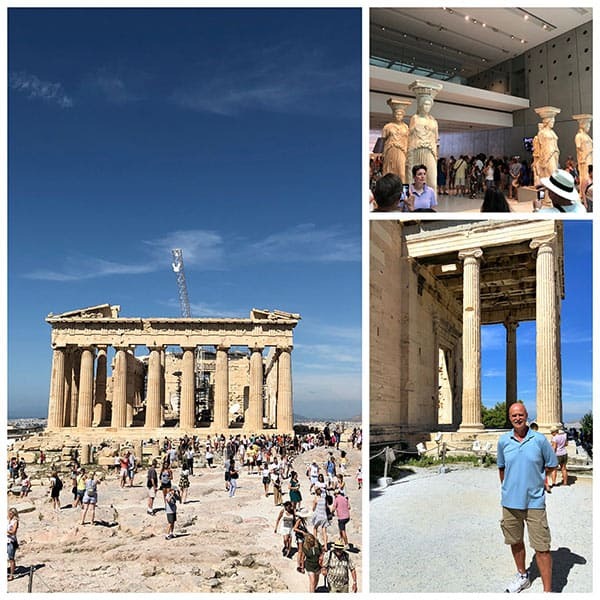 I hope you enjoyed my pictures and recap of our Italy and Greek Isles Cruise. It was an amazing trip and I would definitely recommend this itinerary and Celebrity Cruise Lines. The service we received aboard the ship was top notch. It was a 6th time sailing with Celebrity and we’ll definitely be cruising with them again soon. Would you like more information about a Mediterranean / Italy and Greek Isles Cruise with Celebrity Cruise Lines? 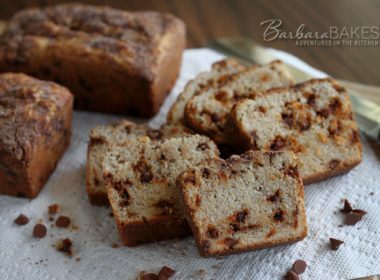 Hi Barbara,thanks for sharing your picks with us. So beautiful. The food looks fantastic.Happy Anniversary . recipes. We also share first names. 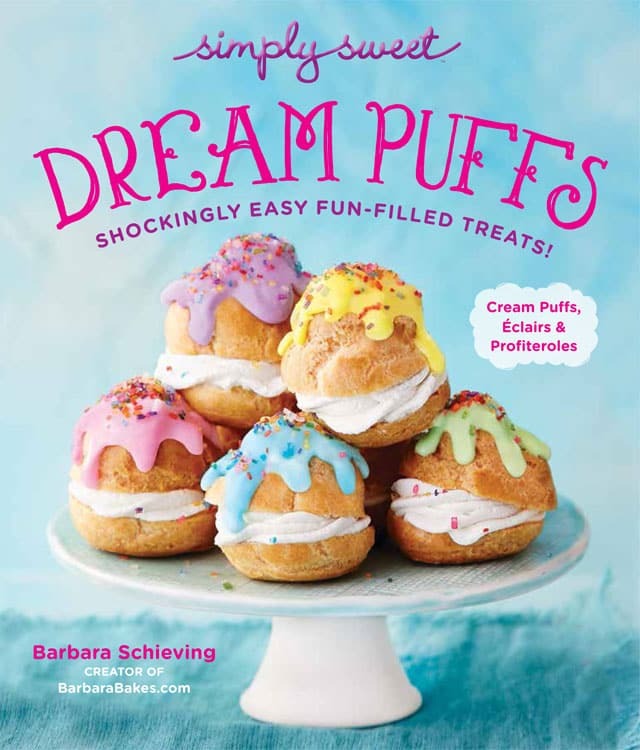 So nice – thanks Barbara!! It’s a beautiful name. 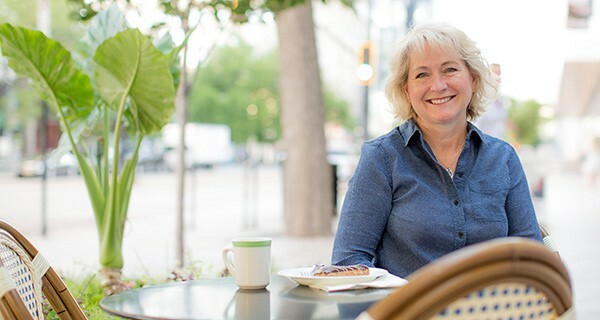 Thanks you so much Carol! It really was an amazing trip.